Different definitions exist for “pharmaceutical analysis”, but it may be reasonably stated as the application of a process or series of processes in order to identify and/or quantify a drug or medicinal substance, the components of a solution or mixture, or the determination of the structures of chemical compounds. “Pharmaceutical analysis” is the subject which deals mainly with the quantitative analysis of those chemicals and dosage forms associated with the practice of pharmacy. It provides training ground for the accuracy expected from pharmacy graduates, with the help of such compendia as the USP, BP, NF, IP etc. In this aspect, it can be said that the scientist have given drugs to the people of the world and the pharmacy graduates guarantied the quality of those drugs now and in the future. 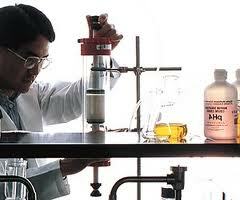 The analytical procedure that deals with the qualitative property of a drug substance is called “qualitative analysis”. For example, when a completely unknown sample is presented to an analyst, the first requirement is usually to ascertain what substances are present in it. The fundamental problem may sometimes be encountered in modified form of deciding what impurities are present in a given sample, or perhaps of confirming that certain specified impurities are absent. The solution lies within the province of qualitative analysis. The type of analysis required: elemental or molecular, routine or occasional. In order for the substance to absorb certain wavelengths it is necessary for the given species to absorb light. The sample may appear colored and absorb in the visible or it may abosrb in the UV and thus appear colorless. By measuring each sample at the particular wavelength where the analyte absorbs light, a plot of the absorbance vs. the molarity of the solution can be created. Because the amount of radiant energy absorbed is proportional to the concentration of the absorbing material, it is possible to create a linear plot of absorbance vs. molarity when a set of standards of known concentration is measured. This is termed a Standard Curve. An equation for this line can be derived and the concentrations of phosphates in an unknown can then be quantitatively determined. If the sample you are measuring absorbs in the visible range corresponding to one of the diodes on the Vernier Colorimeter, you can use these with the Logger Pro software as you did for the equilibrium/spectrophotometry experiment earlier this semester. If the sample absorbs in the UV, then you will need to use the Ocean Optics spectrophotometer and software. To make a spectrophotometric analysis, you must have a series of standards which span the concentration range you expect in your samples that also have absorbance values less than 1. Once you make the measurements for the standards you will generate a standard curve to determine the concentration of the analyte in your samples. Quality control of any pharmaceutical preparation is a very important aspect. No pharmaceutical products can be manufactured without any compounding or manufacturing error as no machine can provide hundred percent recovery results. However, there are various specifications that specify the considerable range of variations for the maintenance of product quality. The ultimate purpose of this study was to check out the product quality of Tetracycline HCl in terms of drug content by estimating the content of active Tetracycline hydrochloride from the capsule preparations which are available in the local market, to find out whether they meet the label claimed or not. Spectrophotometric determination of tetracycline hydrochloride concentrations in the presence of thiamine bromide and riboflavin at a light absorption wave length of 300 nm was shown possible. When the ratio of tetracycline hydrochloride and the total of thiamine bromide and riboflavin (w/w) were at least 10:1 the error of the method was less than 2 per cent. The procedure is useful in quality control of the dosage forms. A simple and rapid analytical procedure was proposed for determination of tetracycline in pharmaceutical formulation, urine and plasma based on chemometrics methods and spectrophotometric measurements. The calibration set was constructed with twenty solutions in concentration range 0.25—13.00 μg ml−1 for tetracycline. The procedure was repeated at nine different pH values. Partial least squares (PLS) models were built at each pH and used to determinate a set of synthetic tetracycline solutions. The best model was obtained at pH 8.00 (PLS-PH8). Parallel factor analysis (PARAFAC) model was applied to a three-way array constructed using all the pH data sets and enabled better results. The capabilities of the method for the analysis of real samples were evaluated by determination of tetracycline in pharmaceutical formulations and biological fluids with satisfactory results. A sensitive and specific method is described for the simultaneous determination of oxytetracycline, tetracycline (TC), and chlortetracycline residues in edible swine tissues, by combining liquid chromatography with spectrofluorometric and mass spectrometry detection. The procedure involved a preliminary extraction with EDTA-McIlvaine buffer acidified at pH 4.0, followed by solid-phase extraction cleanup using a polymeric sorbent. The liquid chromatography analysis was performed with spectrofluorometric detection after postcolumn derivatization with magnesium ions. The limits of quantification were 50 g/kg for muscle and 100 g/kg for kidney tissues. The recovery values were greater than 77.8% for muscle and 65.1% for kidney. The method has been successfully used for the quantification of tetracyclines in swine tissues samples. The selective liquid chromatography mass spectrometric analysis for confirmation of oxytetracycline in one positive swine muscle sample was made by atmospheric pressure chemical ionization (APCI). The APCI mass spectra of the TCs gave the protonated molecular ion and two typical fragment ions, required for their confirmation in single ion monitoring scan mode in animal tissues. A simple, rapid, and simultaneous analysis method for oxytertracycline, tetracycline, chlortetracycline, penicillin G, ampicillin, and nafcillin in meat has been developed by using electrospray ionization tandem mass spectrometry. The sample preparation was performed by homogenizing with water followed by a centrifugal ultrafiltration, after addition of internal standards (demeclocycline, penicillin G-d5, ampicillin-d5 and nafcillin-d6). The MS/MS analysis involves the combined use of sample enrichment on the short column and a multiple reaction monitoring technique. The overall recoveries from animal (bovine and swine) muscle, kidney, and liver fortified at the levels of 0.05 and 0.1 ppm ranged from 70 to 115% with the coefficients of variation ranging from 0.7 to 14.8% (n = 5). Analysis time, including sample preparation and determination, is only 3 h per eight sample and detection limits for all antibiotics are 0.002 ppm. The method is considered to be satisfactory for the rapid screening of the tetracycline and penicillin antibiotic residues in meat. The interaction of tetracycline and oxovanadium(IV) in aqueous solution was studied by potentiometric and spectrophotometric methods. Oxovanadium(IV) ions form both a positively charged 1:1 and a neutral 2:1 metal–ligand complex with tetracycline. When a 1:1 ligand-to-metal ratio mixture is used at about pH 4.5 the 1:1 species predominates, being replaced at pH 6 by the binuclear complex. The binuclear complex has been isolated and fully characterised. Infrared and EPR studies suggest the existence of two distinct vanadyl binding sites. Our results indicate that the first vanadium coordinates to the BCD-ring system and the second one to the A-ring. Biological implications of the existence of a neutral complex at physiological pH are briefly discussed. Stability studies of tetracycline in methanol solution. The stability of tetracycline in methanol solution was investigated by UV–visible spectroscopy, HPLC and TLC methods. After dissolution in methanol, tetracycline decomposed rapidly under the influence of light and atmospheric oxygen, forming more than fourteen different degradation products. None of the previously reported degradation products, such as the epi- and anhydro-compounds, were detected as the final degradation products. The molecular structures for eight of the compounds were suggested by their product-ion mass spectra. A degradation sequence was proposed for the reactions of tetracycline with methanol. A new HPLC–MS mobile phase was developed, which solved the clogging problem at the interface between the HPLC and MS chamber and enabled a high separation efficiency.